Fossil fuels from the Appalachian basin region have been major contributors to the Nation’s energy supplies over much of the last three centuries. Appalachian coal and petroleum resources are still available in sufficient quantities to contribute significantly to fulfilling the Nation’s energy needs. Although both conventional oil and gas continue to be produced in the Appalachian basin, most new wells in the region are drilled in shale reservoirs to produce natural gas. U.S. Geological Survey (USGS) Professional Paper 1708 is a modern, indepth collection of reports, cross sections, and maps that describe the geology of the Appalachian basin and its fossil fuel resources. 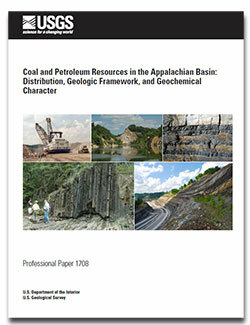 This publication supplements and updates older USGS regional studies of Appalachian basin coal and petroleum resources. Some chapters are new, and several have been published in outside journals or as other USGS publications. Although this volume is not a comprehensive regional treatment of all notable geologic and fossil fuel localities in the Appalachian basin, the selected study areas and topics presented in the chapters pertain to large segments of the basin and a wide range of stratigraphic intervals. This volume discusses the locations of coal and petroleum accumulations, the stratigraphic and structural framework, and the geochemical characteristics of the coal beds and petroleum in the basin, as well as the results of recent USGS assessments of coal, oil, and gas resources in the basin. Many of the maps and accompanying data supporting the reports in this volume are available from chapter I.1 as downloadable geographic information system (GIS) data files about the characteristics of selected coal beds and oil and gas fields, locations of oil and gas wells, coal production, coal chemistry, total petroleum system (TPS) boundaries, and bedrock geology. Log ASCII Standard (LAS) files for geophysical (gamma ray) wireline well logs are included in other chapters. Professional Paper 1708 is intended primarily for geoscientists in academia, industry, and government who are interested in Appalachian basin geology and its coal and petroleum resources. Other users, however, may find the topics, papers, and digital images valuable for land-use and policy planning. Among the anticipated benefits of the report are improvements in (1) resource assessment estimates and methodology, (2) exploration strategies, (3) basin models, and (4) energy use policies. To download individual chapters, see Contents section of this page. Chapters are presented as PDF files. They may contain links to files in other formats. Ruppert, L.F., and Ryder, R.T., eds., 2014, Coal and petroleum resources in the Appalachian basin; Distribution, geologic framework, and geochemical character: U.S. Geological Survey Professional Paper 1708–A.1 through I.1 [42 chapters are separately paged], http://dx.doi.org/10.3133/pp1708.